Find 500 Differences Game: Train your brain in this fun puzzle game! Look at the two photos which seem identical and try to find the 5 differences. Can you spot all of them? Simply tap on a difference to mark it. Be careful: tapping a wrong spot will give you a time penalty. Be quick to earn 3 stars per level and complete over 100 levels with beautiful images! You can play this game on all devices. 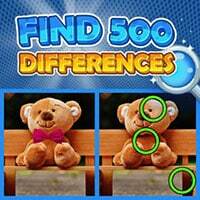 So enjoy and have fun in playing Find 500 Differences Game on Round Games.